WHEN: Shows are Saturday, January 26, at 8pm and Sunday, January 27, at 3pm. WHERE: HACPAC located at 102 State Street Hackensack, NJ. TICKETS: All tickets are only $20. Children under 4 are not permitted into the theatre. Children under 16 not permitted without parent. 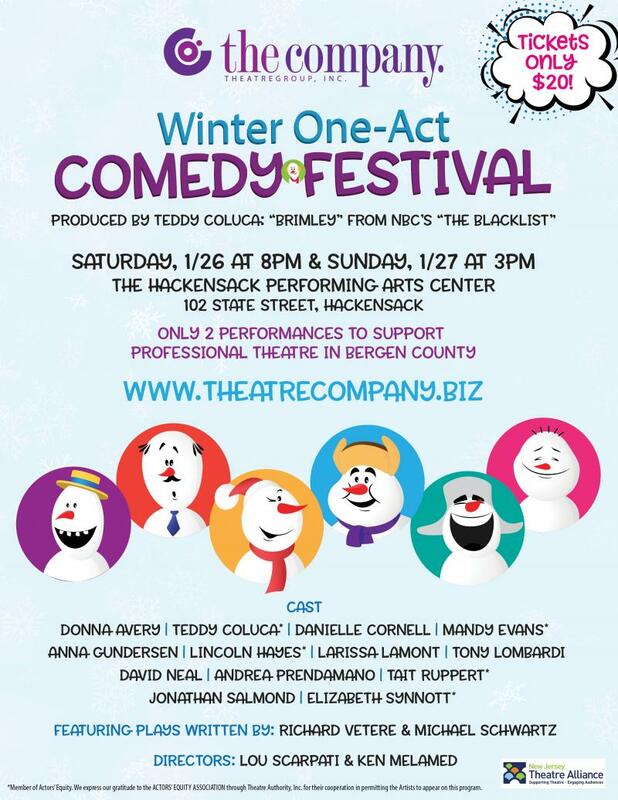 Fair Lawn resident Teddy Coluca who plays Mr. Brimley on NBC’s The Blacklist is producing and leading the ensemble in The Company Theatre Group’s Winter One-Act Comedy Festival at The HACPAC. This is a 2 night only special production featuring veterans of The Company as well as new faces. Managing Artistic Director Lou Scarpati and Ken Melamed will direct the four one-acts by writers Richard Vetere and Michael Schwartz. An associate Member of the New Jersey Theatre Alliance, The Company Theatre Group is the only professional theatre company in residence at the HACPAC located at 102 State Street Hackensack, NJ. Mr. Coluca has appeared in multiple commercials, TV shows (The Blacklist, The Marvelous Mrs. Maisel, Blue Bloods, Bull, and the Netflix Series The Good Cop) and films (The Week Of (Adam Sandler), Hot Air (Steve Coogan & Neve Campbell) and the Independent films The Mimic, Abe & Low Tide). He is a proud member of The Company and appeared in their productions of Breaking Legs and The Underpants. Founded in 2007, The Company Theatre Group is a non-profit, professional company of actors, writers, and directors in residence at The Hackensack Performing Arts Center, Hackensack, NJ. Drawing inspiration from the acclaimed Group Theatre, The Company is dedicated to developing and nurturing artists in an imaginative and safe setting, while at the same time pushing the boundaries of contemporary theatre with its non-choreographed style of production. Like the Group Theatre, The Company creates heightened authentic human behavior on stage or “Life in Fiction” as we like to call it. Our actors truly live in the moment, so no two performances are ever the same. The Company creates an entertaining environment and a thought-provoking experience where each audience member can feel like a 'fly on the wall', watching the lives and events of real people in real situations unfold (and sometimes unravel) right before their eyes.